I got an e-mail about a pilot program taking place in Detroit. 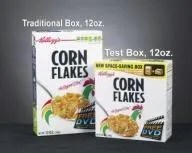 Battle Creek based Kellogg is conducting a six month test with a redesigned box at Kroger’s and Walmart’s in the Detroit area designed to save shelf space. Kellogg Co., the largest U.S. cereal maker, has reconfigured the size of its boxes in an effort to sell more Froot Loops and Special K at Wal-Mart Stores Inc. and Kroger Co. stores in Detroit. Kellogg is replacing cereal at 40 Wal-Mart and Kroger stores with shorter, deeper containers that hold the same amount, Kim Miller, vice president of morning-foods marketing, said in a telephone interview. The six-month test starts today. After several years of research, Kellogg reduced packaging by 8 percent for the test, wagering that consumers who lack kitchen storage will buy cereal in smaller boxes, Miller said. They’re not shrinking the amount of cereal you get, they’re just shrinking the box and getting rid of all that empty space. The interesting thing is Walmart is encouraging companies to come up with new packaging ideas that save space and are rewarding companies that do so with premier display space. The new packaging won’t cost you anything more…at least yet..